When it comes to water, Portland should be the leader, not the follower. Oregon is renowned for its mountain waters that melt from clean winter snows off of the peaks of the Cascades. Now, the largest city in the state is set to vote in a special election on May 21 whether it will add fluorosilicic acid to its public waters. Portland is the largest city in the United States that does not fluoridate its public drinking water. Nick Fish, Commissioner for Public Works, who played a significant role in advocating for fluoridation in Portland, has made clear his stance on the issue. His August 16, 2012 statement declared that cities save an estimated $38 in dental costs for every $1 toward the public fluoridation process. This seems to cry far from the truth where public schools already provide fluoridation treatments for their students and countless topical fluoride products may be found at any local store. During a time when water and sewer rates are increasing drastically, despite across-the-board city budget cuts outlined just days ago, it is an exercise in wonder to find Portland’s commissioners touting the construction of a $5 million facility [Portland Water Bureau] with a $575,000 per annul operating and chemical cost. Especially considering there are so many less expensive and more targeted approaches to preventive periodontal care. Furthermore, the city has paid scant attention to fluorosilicic acid’s effects on the environment. The Sierra Club has urged voters against the passage of adding fluoride to Portland’s public waters because of negative effects on salmon and aquatic life [Sierra Club Opposes Portland Water Fluoridation Measure 26-151]. Would adding more of this acid contribute to the already rapid acidification occurring on our oceans’ surfaces (a 30% increase since the dawn of the Industrial Revolution [Arctic Ocean ‘acidifying rapidly’]. 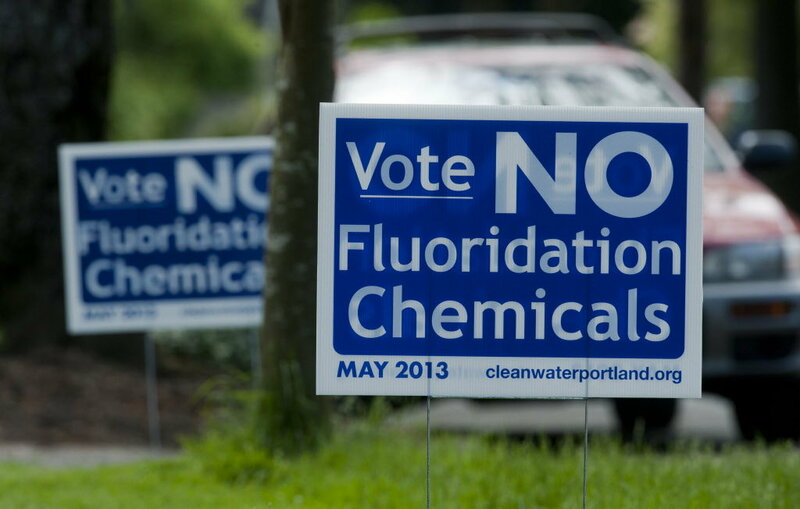 Consumer choice and the ethical considerations of mass medication are strong arguments in favor of rejecting the Commissioner Fish’s proposal to fluoridate Portland’s public waters. There are currently no federal laws requiring vaccination [CDC State Vaccination Requirements] of children (however, many states require such vaccination before enrolling at public schools). Why should a citizen be forced to choose between buying bottled water and subjecting their children to ingestion of a chemical intended for topical use only? The proposal restricts our choice and is unethical to the extent that it is an attempt to mass medicate a population. We don’t even make such requirements of our vaccines. Portland may be the largest city in the United States not to fluoridate its water. However, entire countries have banned the practice of fluoridating their public water altogether. Japan, the world’s third largest economy, ceased fluoridating its water in the early 70s, as did Sweden. Finland, Germany, and Czechoslovakia stopped the practice in the 90s. Their ministers have cited all of the above arguments for imposing fluoridated water on their populations. As the proposal is set for a vote, citizens should consider not whether they believe there are health benefits or not to adding fluoride to our water but whether these benefits can be achieved through measured and responsible administration that respects the realm of parents and respects citizens’ consent. Citizens should consider Portland leading the way.